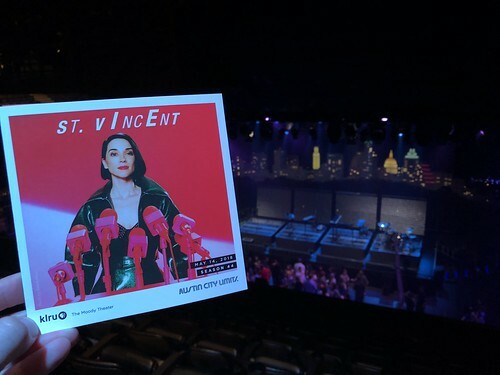 I had the opportunity to attend an Austin City Limits taping this past Monday for St. Vincent. For those that aren’t familiar, St. Vincent is the stage name for Annie Clark. This is her second appearance on the show. Her ACL artist page has details on the first appearance. ACLs own recap from Monday can be found here. The episode will air in the Fall as a part of Season 44 on KLRU locally or on your PBS station. I first learned about St. Vincent sometime just before her third album, Strange Mercy, was released. I really liked the first single, “Surgeon”. I heard an interview with her either on Marc Maron’s WTF podcast or elsewhere and learned that she grew up in Dallas. As for the new album, I ran through it a few times on Spotify prior to the show. I’ve heard “Los Ageless” which grew on me after only a few additional listens and I also found that I immediately liked “Pills” and “New York”. She visited Austin back in February as a part of her Fear the Future tour. The stage show on Monday was quite elaborate by ACL TV standards and is clearly designed to reflect themes from her most recent album, MASSEDUCTION. She came out in an all red latex suit and took the stage with her three backing musicians, each on their own separate LCD floor and background screen. Being in the balcony was a benefit for this show due to the elaborate lighting that was used below and behind each performer. The keyboardist and drummer both wore very drab brown jumpsuit costumes (and masks?) in contrast to the female bass player and Miss Clark. I definitely thought of both David Bowie and Kraftwerk in watching the spectacle. She’s a pretty accomplished vocalist and guitarist. The solo performances held up as well if not better than those with a backing band. I’ll be interested to see how the light show translates onto television. 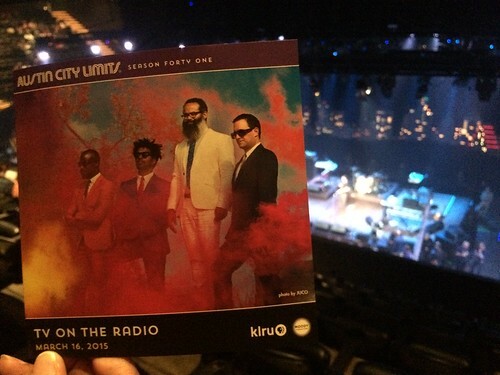 As always, ACL TV producer Leslie Nichols posted a shot of the set list to her Twitter account. Check out previous ACL TV posts going back to 2008. Austin Opera continues to be an outstanding asset to Austin. The number of children in the audience at the opening performance of Carmen was astonishing; even more astonishing is that they stayed to the end and were not restless. These were elementary-school students. Perhaps they were in attendance to see and hear siblings perform in the children’s chorus, which was excellent, as was the large adult chorus. The orchestra grows better and better and better. Under the baton of Richard Buckley, it rendered true justice to the beautiful score. The principal singers embodied their characters well, and they sang exceptionally, solo and with other members of the cast. Austin Opera is especially fortunate to have such strong singers in the roles of Don Jose and Escamillo. It sometimes seems that the male members of a cast do not rise to the level of the female singers, but such is not at all the case in this production. Set in Spain, the four-act opera by Georges Bizet is sung in French. Above the stage, there are supertitles in English. The translation is good and the coordination of the titles with the action on stage was always precise. Although there was perhaps an element of almost silent-screen action in the last act, with somewhat overwrought physical action and dramatic movement, the direction of the large cast was otherwise supremely managed throughout, taking every advantage of the versatile and handsome set. In some performance of this work, professional dancers take the stage in certain scenes, in this one the singers appeared to execute the inventive choreography themselves, and very well. On line there’s a synopsis of the plot. Those who do not know the opera should ignore it and be drawn in by the momentum of the unfolding action. Acts I and II last 90 minutes. A 25-minute admission is followed by acts III and IV, running 60 minutes, so that the total performance time is about three hours. Advance tickets are available for the remaining shows: 7:30 PM, Thursday, November 16; and 2:30 PM, Sunday, November 19. Performances are at the Long Center for the Performing Arts, 701 West Riverside Drive. Early arrival allows enjoyment of the scenic terrace looking toward downtown. Be warned: parking at One Texas Center that was once free, with designated spaces for Car2Go vehicles, is now behind a barrier and costs $5; a credit card must be used. Opera-goers did not know how to get in to the lot (there are bollards and drop barriers), and they did not know how to exit. The parking annoyance, however, is no reason at all to miss this memorable production of Carmen. I can’t remember exactly where I first heard about Run The Jewels or “RTJ” as they and their fans refer to them. I’m pretty sure it was somewhere on the Internet. 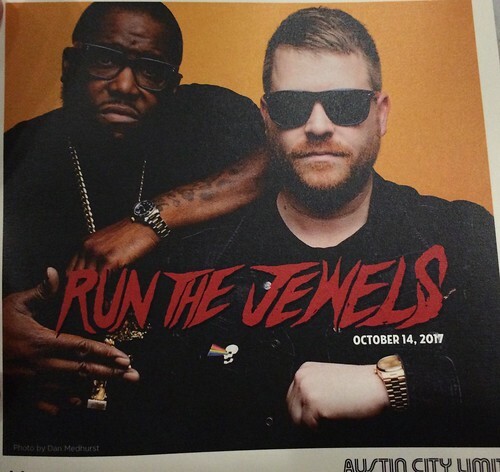 The oldest e-mail I have from their mailing list is September of 2014 prior to their release of their second album RTJ2. I decided to try out the first album because they made it available to download for free (well, in return for your e-mail address) and they’ve done that with their follow up albums. You can get all three at their web site. Killer Mike of RTJ is an activist and has made the rounds on many talk shows like Stephen Colbert. He was outspoken during the 2016 election, campaigning for Bernie Sanders. He did several interviews about the violence in Ferguson. Interestingly, Jaime Meline, the other half of RTJ, used his real first name in the e-mails from their mailing list until the beginning of 2106 when he started to use EL-P. And then there’s Meow The Jewels, which I somehow totally missed and am still not sure I get. 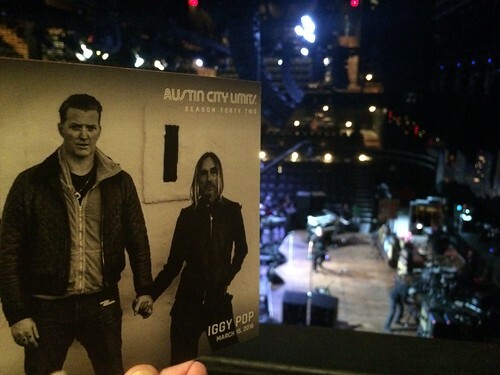 I happened to see their show on Sunday of Weekend One of Austin City Limits festival. In addition to both weekends of ACL Festival, they played to a packed house at Stubb’s the first Friday night and then did the taping this past Saturday. Both the festival show with its massive crowd and the smaller taping audience were very energetic. The taping audience was fairly sparse, probably due to Weekend Two of the festival along with OU weekend. You can find ACLs review of the taping on their blog. It will air later this season (locally on KLRU). As she usually does, ACL producer Leslie Nichols shared the set list from her Twitter account. You can keep tabs on the schedule and upcoming tapings on their site as well. You can find my previous taping posts going back to 2008 here. The summer production of the Gilbert & Sullivan Society of Austin is a delight for all ages. Elementary-school students enjoyed the entire Father’s Day Sunday matinee performance with complete attention from start to finish. A large orchestra, a cast that sings, dances, and acts at the highest level, and a fully theatrical production presented to the audience in an intimate theater with excellent acoustics are a credit to all who have had a hand in bringing this wonder of live theater to Austin. So stellar is the cast that it’s not possible to single out any particular singers, old favorites or new ones, but the combination of earnest sincerity and comic exaggeration cannot be surpassed, bringing the clever lyrics and spritely music to brilliant life. As the audience headed home, hearts were light and smiles were omnipresent. Remaining performances at the Brentwood Christian School are: Friday (today), June 24, 7:30pm; Saturday (tomorrow), June 25, 2 pm, and 7:30 pm; and Sunday, June 26, 2 pm, Everyone sings with the utmost clarity; all performances are supertitled so that not one nuance fails to be appreciated. This show is guaranteed enjoyment. Don’t fail to treat yourself and your friends and family to a very special event.